The Spanish School, one of Middlebury’s 11 Language Schools, celebrates its 100th year. Here are a few words from current affiliated staff who have witnessed some of its evolutions. Professor Joseph Casillas of the Spanish School (MA, Class of 2010) poses for a photo. 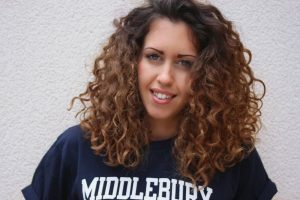 Bilingual Assistant Laura Cabrera of the Spanish School is pictured here, in Middlebury gear. Middlebury’s Literatures & Cultures Librarian Katrina Spencer poses at the Research Desk in the Davis Family Library. Having obtained a master degree from the Spanish School in 2010, she now serves the school as the Language Schools’ library liaison. LC: I’m a bilingual assistant in the Spanish School. When did you first encounter the Spanish School? 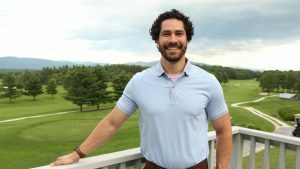 JC: My first experience in Middlebury was in 2007 as an MA student in the Spanish school. LC: I arrived to Middlebury in 1998 when I was a little girl because my dad [Carlos Cabrera] was a teacher in the Spanish School. KS: I arrived to Middlebury in 2009 and graduated from the master program in 2010. I’d been looking for a school that would allow me to complete my degree overseas and this was one of the two I found. Has your role always been the same? JC: No. I spent two summers in the Spanish school finishing my MA. Afterwards I spent two consecutive summers in the French school, as a pure beginner in level 1 and the following summer in level 4. The following two years I returned to the Spanish school to work as a bilingual assistant, and the past 3 years I have worked as a professor in the undergraduate 7-week program. LC: First I came as a dependent with my parents but since 2007 I’ve been working as a bilingual assistant at the Spanish School. KS: No. At first I was a master student, then a non-degree seeking student in the Portuguese program and now I’m a librarian. 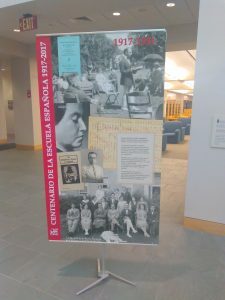 Over the summer, the Spanish School placed several banners in the atrium of the Davis Family Library to commemorate its centennial. This one documents its beginnings in 1917. Tell us about the diversity of the program. JC: The Spanish school program is rather diverse. In any given summer there are professors and students from most of the Spanish speaking countries in the world. The students are particularly diverse in many different ways. In terms of age, in my classes I have had students that just finished high school, all the way up to retirees that decided to learn Spanish for fun. But the student body at Middlebury is diverse in other ways as well. For example, I have had students that work as government agents, and other military special forces, as well as high school teachers of other languages. LC: Faculty and staff come from different places around the world: Spain, Mexico, Cuba, United States, Argentina, Colombia, Venezuela, Puerto Rico, etc. And we have some students that are from different parts of the United States and other countries like India and China, so the Spanish School is culturally diverse. KS: In terms of the faculty, without having to do much mental exercise at all, I know that Cuba, Mexico, Peru, Spain, and the United States are all represented. In terms of the student body, you find students aged 19-50+. That’s always something that has quite impressed me. During my first summer, we had a nun in our program and at least one student completing the doctorate of modern languages. People come to Middlebury for a wide array of reasons and from a variety of backgrounds. This year they have a lawyer who’s engaged in immigration law. 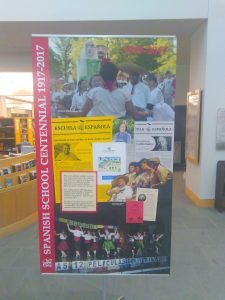 This banner reflects some of the most recent developments and cultural celebrations led by the Spanish School. Over the years, what changes within the school and what remains the same? JC: There are many things that stay the same. Middlebury, itself doesn’t change much. In the ten years that I have been around, the faculty hasn’t changed too much. Certain aspects of the program that we do every year typically stay the same, but every summer is unique in its own way because of the students. Sometimes there are students who repeat, and the graduate students typically spend multiple summers in the program, but the majority of the undergraduate students are new. It is always fun to see how diverse and talented they are. I’ve also seen many of the professors children grow up over the course of several summers. It truly is a unique experience. LC: In my opinion, almost everything is the same as my first time here. Some people come back and some people don’t, but the main spirit of the “Spanish school family” is the same, summer after summer. Middlebury is like a bubble, no matter how you spent the whole year, if you go back for another summer, you’ll feel the last summer was yesterday instead of a year ago. KS: Much of the professoriate remains the same! The Spanish School attracts and retains excellent instructors. Some have been teaching in the program more than 15 years. Mariluz Gutiérrez Araus and Mercedes Fernández-Isla are two of them. One change that I’ve noted is that program now has a website where students can follow its activities. It’s very colorful and up-to-date, reflecting the technology use of our time. Also, I believe we have a school site in Argentina now. Formerly students were able to complete a summer of study in Mexico, which I did, and now you can do it in South America. Oh, and the Literary Analysis students join together and receive a library orientation session in Spanish! 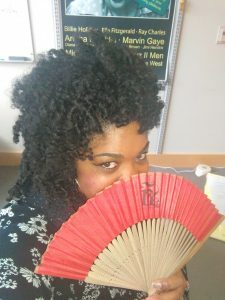 Literatures & Cultures Librarian Katrina Spencer poses with an “abanico,” a fan, designed for the centennial. Other accouterments for the 100th year celebration included buttons and “pañuelos,” scarves or handkerchiefs, all marked with the letter “ñ“. How do you and your community within the Language Schools use the libraries and our resources? JC: I used the library much more for research as an MA student. Since then, I mainly use the library for preparing classes and meeting with students. LC: As an office manager at the Spanish School, I don’t use the library so often. We usually borrow some films to show and some tech devices we need for the events. I think the students use the library more often, like a studying place and using the resources: books, movies, etc. KS: When I was a student, we graduate students used JSTOR quite heavily to find academic articles of literary criticism. This database is still popular among Language School students in general. The Spanish-language browsing collection that includes readings like Manolito Gafotas and music by flamenco-style singer Buika is also popular. In the instruction sessions I give, I really try to plug Lexis Nexis for finding news articles, Kanopy for online film streaming and our Alexander Street vendor for listening to music online. There are also special carrels/study spaces in the library assigned to each language school. What do you envision for the Spanish School’s future? 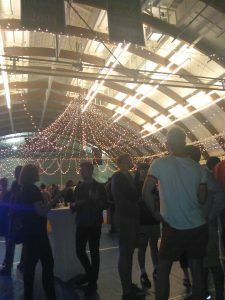 The Spanish School hosted a special dance party with live music to which all the Language Schools on the Vermont campus were invited to fete the centennial occasion. JC: I think one of the big changes facing the program in the upcoming years is related to heritage speakers. Every summer we get more and more students with this profile, which makes sense because of the changing demographics in the US, and I hope to see explicit attention given to these students in the program’s curriculum moving forward. LC: I don’t know what will will be the future of the Spanish School, but I’m sure it depends on the students because they are a different group every summer. So, like Joseph said, I think the heritage speakers will be a very important part of the program in the next years. KS: Changes in the school will likely mirror changes in society, ¿no es cierto? Perhaps there will be more demand for courses representing Central America and indigenous populations as we have more people within the United States that represent that region. I imagine the school will become even more diverse as more people realize the importance of speaking Spanish merely as residents in the Western hemisphere. And I hope that more classes will request library instruction sessions so students can navigate our spaces with even greater confidence. 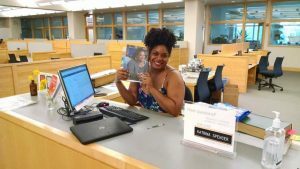 This entry was posted in Midd Blogosphere and tagged centennial, Liaisons, library, Library News, libspotlight, LIS Staff Interest, lisblog, MiddPoints, Post for MiddNotes, Post for MiddPoints, Spanish School on September 13, 2017 by Katrina Spencer. Liaison Discussion: My Very First MOOC. Led by Steve Bertolino. Topic: My Very First MOOC. Led by Steve Bertolino. Where and when: Wednesday, October 8, 10-11 am. LIB145. Description: Steve took a 12-week MOOC and survived! Come for an overview of what the course was like. We’ll have a discussion exploring the pros and cons of the MOOC style of online learning. “Liaison Discussion Section” meetings address research and/or technology topics of interest to liaisons. They can be conversations, or presentations, or both. Anyone is welcome to attend. This entry was posted in Midd Blogosphere and tagged liaison, Liaisons, LIS Staff Interest, Training on September 24, 2014 by Carrie Macfarlane. Topic: Data Management. Led by Wendy Shook. Where and when: Friday, October 25, 10-11 am. LIB145. Description: Wendy will bring us up to date on the status of science data management, data management planning, and a pilot data repository in the making. This entry was posted in Midd Blogosphere and tagged Liaisons, LIS Staff Interest, Training on October 16, 2013 by Carrie Macfarlane. Topic: Information Security Road Show. Led by Ian Burke, Network Security Administrator. Description: Information Security: Why should we care about it? What are the recommended practices for keeping computers and identities secure? This is a near-total revamp of last year’s information security presentation, and Ian will be bringing it to other offices at Middlebury as well as out to Monterey. Come learn, share, and provide Ian feedback as he prepares for his travels. This entry was posted in Midd Blogosphere and tagged Liaisons, LIS Staff Interest, Training on May 17, 2013 by Carrie Macfarlane. Where and when: Tuesday, April 16, 2013. 1-2 pm. LIB 145. This entry was posted in Midd Blogosphere and tagged Liaisons, LIS Staff Interest, Training, workshops on April 10, 2013 by Carrie Macfarlane. Topic: Assessment. Led by Adela Langrock, Office of Planning and Assessment. Where and when: Tuesday, March 12, 10-11 am. LIB 145. Description: Adela will tell us what academic departments and programs been asked to do regarding assessment of student learning, share some examples of what departments have chosen to do, and discuss how assessment is a continuous process that should build over time. We’ll then share some ideas regarding how LIS staff can contribute to information literacy assessment efforts, both through our information literacy pilots and through our individual course-related workshops. This entry was posted in Midd Blogosphere and tagged liaison, Liaisons, LIS Staff Interest, Training on March 6, 2013 by Carrie Macfarlane. This entry was posted in Midd Blogosphere and tagged liaison, Liaisons, LIS Staff Interest, workshop on February 13, 2013 by Carrie Macfarlane.